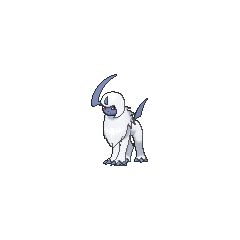 Absol in game: 6,176 Who? Important notice! Pokemon Absol is a fictional character of humans. Absol lives in the mountains far from civilization, and rarely ventures down from its alpine home. 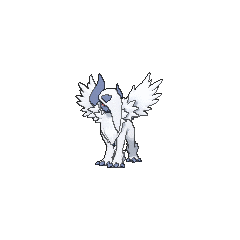 Using its horn, Absol is able to sense even subtle changes in the sky and the land to predict when a natural disaster will occur, and will try to warn people when one is approaching. This often has the unfortunate effect of Absol itself being blamed for the disaster. 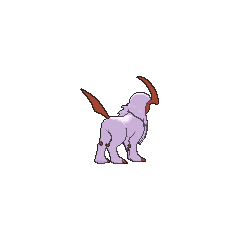 Absol first appeared in the first Advanced Generation seriesmovie, Jirachi: Wish Maker. The Disaster Pokémon showed up to take Jirachi back to Forina. 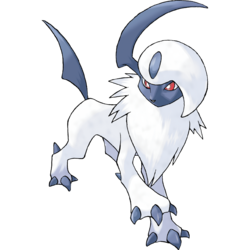 However, Absol wasn't evil, and helped Jirachi once it returned to Forina. The Disaster Pokémon made its first anime appearance in Absol-ute Disaster. The people of a town were blaming Absol for all the bad things that were happening to their town during the past month. Ash and friends (along with a boy named Nicky) went out to search whether or not the accusations were true. They found out that the Absol was actually warning the town about a flood. An Absol owned by a Coordinator named Mollie appeared in What I Did for Love!. It was used in the second round of the Gardenia Town Pokémon Contest where it battled Brock's Marshtomp and lost. Drew caught and trained an Absol for the Kanto Grand Festival, as seen in May, We Harley Drew'd Ya!. It was first used in the Appeals Round and then again in a two-on-two Contest Battle alongside Flygon against May's Combusken and Squirtle. Four Absol appeared in Arceus and the Jewel of Life under the ownership of Damos. 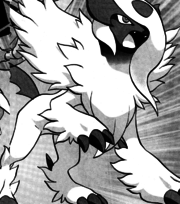 Mega Absol made its debut appearance in Mega Evolution Special I and appeared in Diancie and the Cocoon of Destruction and Valuable Experience for All!, under the ownership of Astrid. 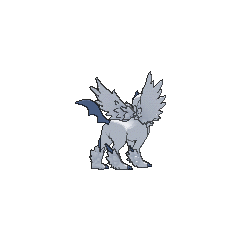 An Absol appeared in The Bonds of Evolution!, under the ownership of Magnus. An Absol appeared in Mutiny in the Bounty, captured by the evil Hunter J and her henchmen after Ash's Pikachu, Melodi's Gardevoir and Team Rocket's Meowth got stolen. The Absol was returned to its rightful owner after Ash, Team Rocket, and Melodi reunited with their Pokémon and some of J's minions were arrested. An Absol made a brief cameo in Destiny Deoxys and Giratina and the Sky Warrior. 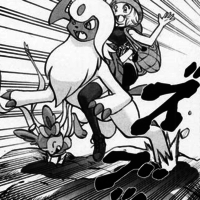 An Absol appears in the Ruby & Sapphire chapter of the Pokémon Adventures manga. It first appears to Ruby, who shudders in fear immediately. Absol is also present in the feud between Kyogre and Groudon. Like in the anime, Absol is accused of bringing disaster. This Absol appears again at the start of the Omega Ruby & Alpha Sapphire chapter where it appeared on top of a building foreshadowing another disaster coming to Hoenn. 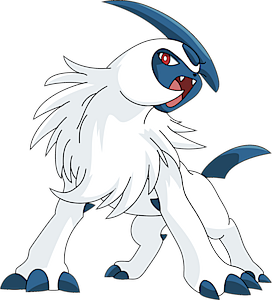 In Scizor Defends, Y encountered an Absol on Route 15 and battled it in order to capture a Pokémon capable of Mega Evolution. It made no attempt to resist her efforts and let itself be captured after Y asked it to help battle Team Flare, which it was nicknamed Solsol. 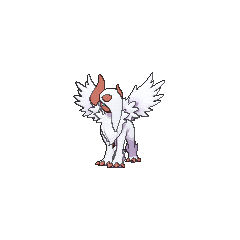 Later it was given an Absolite, enabling it to evolve into Mega Absol. 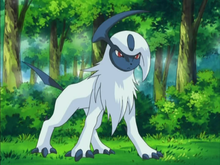 Absol is one of Koya's main Pokémon. It is used in his battles at the Pokémon League, and in subsequent battles against Team Galactic. Erases Pokémon with three lines from upper right to lower left.